I’m so pleased that there’s been lots of enthusiasm and support for this inaugural new bloggers challenge event and am very excited to be able to share all the wonderful entries in the first ever round up. 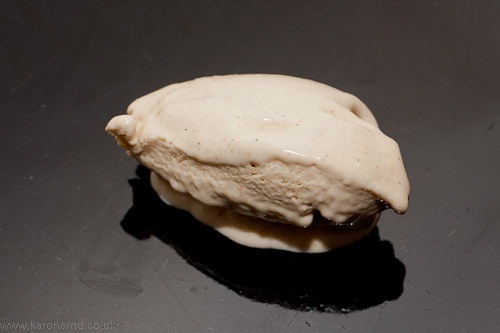 The theme for this challenge was custard-based ice creams. I’ll be announcing the March theme very shortly! First out of the gate was Ozzy from Karohemd’s World with his apple and cinnamon ice cream, a classic and delicious flavour combination. Having never made ice cream before, Ozzy took on the challenge specifically to enter this event, even though he doesn’t have an ice cream machine, or much space in his tiny freezer compartment. It’s a great first attempt and best of all, has started him along the path of home made ice cream! Millie from The Kitchen Princess created a very seasonal rhubarb and custard ice cream. Her starting point was to make her own rhubarb syrup by cooking rhubarb with sugar and pudding wine. This was layered with churned vanilla custard, made to a BBC Good Food recipe from Angela Nilsen, an excellent food writer and recipe developer. Millie declared the results as sweet but not overly so, as the tartness of the rhubarb cut through the sweet custard. Sounds perfect and I’m bookmarking this in the hope our garden and allotment produce a decent crop of rhubarb this year! Kate aka The Little Loaf is, as far as I am concerned, the ice cream queen! 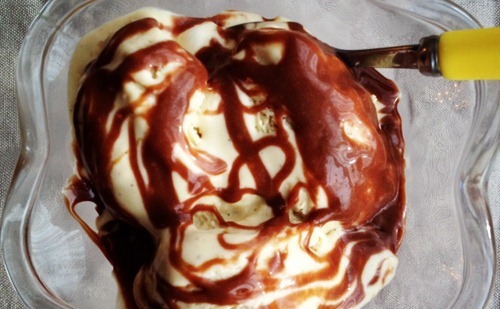 To understand why I say that, just check out her incredible ice cream posts, from Ferrero Rocher ice cream cones to treacle tart ice cream with rosemary sea-salt pastry to honeyed peanut ice cream in peanut butter cups to gingerbread and white chocolate ice cream sandwiches to butterscotch pecan ice cream tartufi… Yeah, see what I mean? So when she agreed to enter the challenge I was very excited to see what she would make. She didn’t disappoint, creating this stunning mint chocolate chip ice cream pie with a bourbon biscuit crust. I love her tales of how she fell for mint choc chip as a child, though am happy that this one is just for the adults, with its indulgent use of crème de menthe. If I ever win the lottery, I’m going to beg Kate to be my personal ice cream chef! I’ve shared my own entry for the challenge as a guest post on Pete Drinks, my husband’s beer and whisky blog. And appropriately enough, the recipe is for a stout & salty roasted peanuts ice cream which aims to recreate the pub experience in a bowl of ice cream! 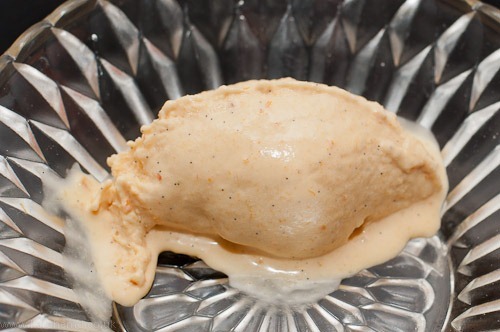 Unlike most beer ice cream recipes I’ve found, which add beer to regular custard or cream, I invented a stout custard – substituting the milk and cream entirely for stout, combined with sugar and egg yolks. 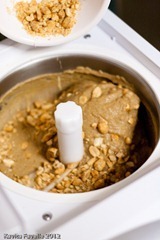 That makes this a great recipe for beer-and-nut-loving ice cream enthusiasts who can’t or won’t eat dairy! As you can see above, Ozzy from Karohemd’s World already made his very first ice cream, which was also the very first entry for this first BSFIC challenge. But he also got the ice cream making bug, and made another delicious ice cream only a week later. 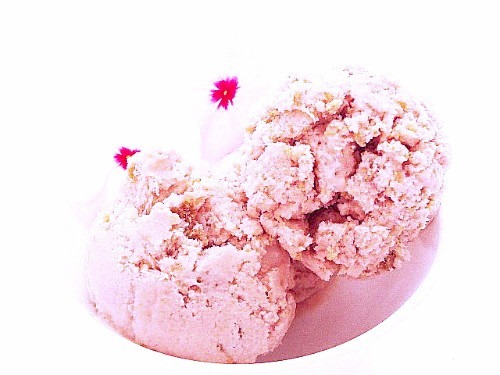 This time he took inspiration from the contents of his organic fruit and veg box and made a spiced blood orange ice cream which he describes as “really tart”, just as he likes it. 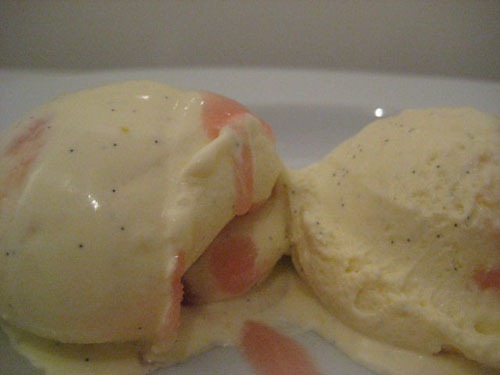 His custard base included fruit juice which he’d already reduced down to really concentrate flavour, a great way to ensure the finished ice cream is good and tasty. Another rhubarb entry from Debs of The Spanish Wok. Debs can’t get fresh rhubarb in Spain, so she created her recipe using tinned, which worked very well, though she does warn about its colour, using food colouring to restore it to a pretty pink. What I really like about her rhubarb crumble ice cream is the idea of baking some crumble topping mix in the oven and adding that to the ice cream to provide a taste and texture contrast from the rhubarb. Clever! Yes, it’s rhubarb again, definitely the ingredient of the month, in another different ice cream from Jennie at Things I Eat. 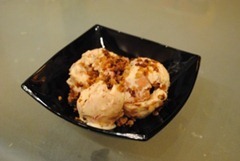 Jennie also made rhubarb and custard crumble ice cream, but she used fresh rhubarb, roasted with demerara sugar, a custard that was both rich from the egg yolks and light from using milk and no cream, and a properly crunchy granola-style topping. The custard was churned first, with rhubarb added right at the end, so it rippled through. The granola was added as a topping and remained nicely crisp. Oh, and you must check out her adorable penguin ice cream scoop – I want one! 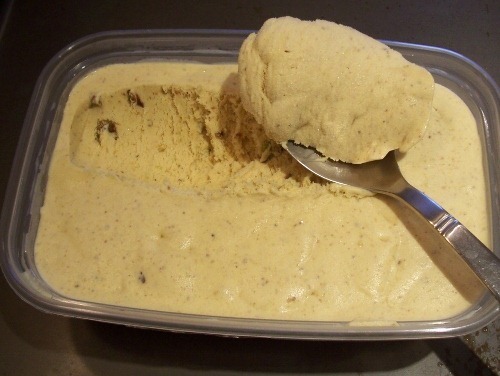 Corina from Searching for spice has combined two of my very favourite flavours in her cardamom and pistachio ice cream. She gently infused the milk and cream for her custard with a crushed cardamom pod and lightly toasted the pistachios before grinding, leaving a few to chop by hand, to add a little texture. The result is this rich and creamy ice cream, a vibrant natural yellow colour rather than the cheap and lurid food-coloured versions that give pistachio ice cream a bad name, and is one I definitely want to devour! Several of the participants in this first BSFIC challenge have proved strangely psychic (see March’s theme, coming up shortly) and that includes Laura from How to cook good food, who harks back to childhood ice cream memories in the introduction to her post on ginger c’rum ice cream. 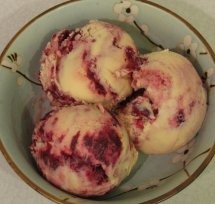 This is her own invention combining ginger nut biscuits, dark rum and currants with some good quality ready-made custard. I’ve used this kind of custard myself to make ice cream and it works really well. 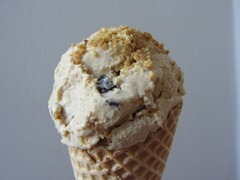 I also love the sprinkling of additional crushed biscuits on top of the scoop in the cone! Ren from Fabulicious Food was another ice cream virgin, and I’m happy that my challenge gave her an excuse to learn a new skill – especially when she compared the ingredients in her home made version to a well-known brand bought from the supermarket, full of additives. Ren made a malted cream ice cream with a mars bar sauce, using Horlicks malted milk powder to flavour the custard and a mars bar melted with a little cream, for a quick and delicious sauce. 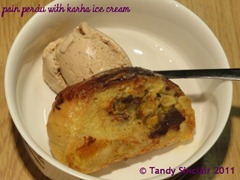 The Horlicks custard was also very good as an accompaniment to honey roasted rhubarb, so just as well Ren made extra! Even though I love Indian chai (and by that I mean tea with Indian spices added, not just the straight translation of the word chai as tea) I didn’t know until I read Tandy’s post on her blog Lavender & Lime, that the masala (spices) mix used in Indian chai is known as karha masala. For her entry into the challenge, Tandy has posted her Indian chai inspired karha ice cream, which she served with pain perdu, or eggy bread as we call it in our house. Another ice cream I’d love to try! Last but by no means least, Jacqui from There’s Proper Food In There Somewhere made an ice cream she says is a bit like cherry bakewell. I enjoyed reading about the thought process that brought her to this unusual flavour idea; the custard-based ice cream theme set her thinking about things you eat with custard, and bakewell tart popped into her head. Once she had that in mind, she created a custard base using ground almonds and amaretto liqueur to add flavour. Towards the end of the churning, she added cherry compote, reduced to make it thicker, and created a pretty ripple effect. Mmm! 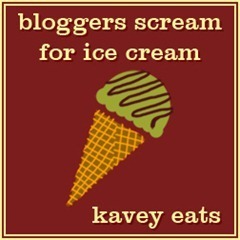 A huge thanks to all of you who’ve entered this inaugural bloggers scream for ice cream challenge, I hope you have enjoyed the theme and will continue to take part. Thank you too, to all those who have supported the new challenge, helped to promote it and generally been enthusiastic! It’s much appreciated. 15 Comments to "Bloggers scream for ice cream: February roundup"
Fab roundup for your first challenge Kavey. There’s some lovely flavours there, I think you’ve done a lot of damage here as we’ll all be eating ice cream every day to try each others flavours too. I need to get some weight on me, so possibly I can say you may have done me a favour LOL. Thanks for including my entry too. Amazing – so many lovely ice creams! I’m not an ice cream fan (is that sacreligious to say here??) but having eaten an absolutely fabulous fruity-tart-yet-sweet Raspberry pavlova ice cream From Archers in Jesmond on Sunday, I was compelled to have a look at your challenge results … and I’m so glad I did! What an amazing selection – I love the idea of a tart blood orange ice cream, and Jennie’s textural rhubarb & crumble. I’m fast coming to the conclusion that it’s not that I’m not an ice cream fan, it’s just that I haven’t met the right ice creams before! 🙂 Congratulations to all your participants, great work! What a great round up, there are some ice creams here that I’m just dying to try! Oh my! What a totally cool round-up! So much inspiration and I love all the rhubarb! I love your creative ‘pub’ experience and there are definitely many flavours here to inspire. Thanks for hosting, a great theme for a blog event! So happy everyone is enjoying the round up – so many great recipes to try or to give inspiration! god they all looks so good!… congrats on your first successful round-up… sorry I couldn’t take part this month but next month just you try and stop me!! Great roundup. I’m looking forward to next month’s challenge now! 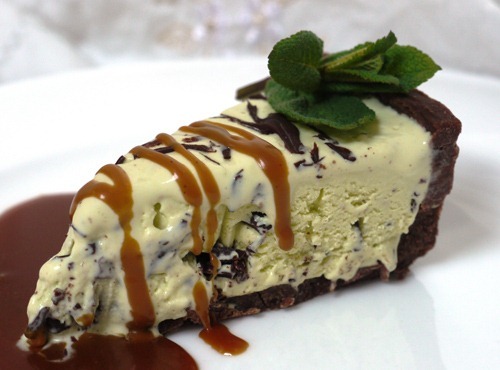 Oh what a round-up (that mint choc chip ice cream pie is a killer…). Great event – apologies that lack of freezer space and general disorganisation kept me away. Love the site redesign BTW! Itching to get mine over and done with.